Le prix et la disponibilité du produit sont corrects en date du 2019-04-19 13:50:35 CEST et sont sujets à changements. Toute informaiton relative au prix ou à la disponibilité affichés pour http://www.amazon.fr/ au moment de la commande sera d'application lors de l'achat de ce produit. 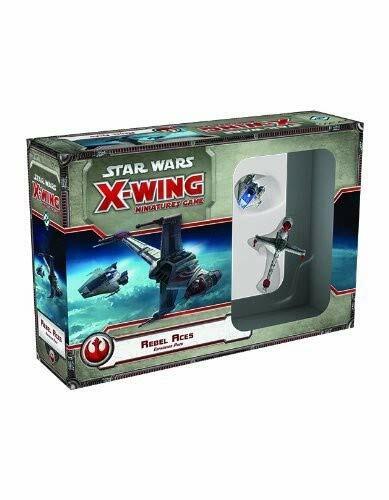 With Expansion Packs for X-Wing, you can bring exciting new strategic options to your fight for the fate of the galaxy! Join the Rebellion and fight for freedom across the galaxy with the Star Wars X-Wing Miniatures Rebel Aces Expansion Pack for X-Wing! Featuring two starfighter miniatures with bold, alternative paint schemes, Rebel Aces allows you to represent the heroic pilots who first flew A-wings and B-wings as experimental prototypes. Youll also find four highly skilled, unique new pilots; thirteen upgrade cards; a dramatic rescue mission; and all the tokens and maneuver dials you need to launch these starfighters into battle against the evil Galactic Empire.